A major revision of a classic text-how to be an effective foodservice manager. When it comes to handling the demands of the foodservice industry, there is no single approach. Quantity Food Production, Planning, and Management goes beyond the mere teaching of technical skills to address the multitude of situations and challenges facing operators today. 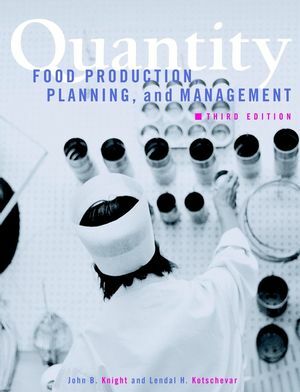 Featuring 50 photographs and new chapter review questions, case studies, vocabulary terms, and references, Quantity Food Production, Planning, and Management, Third Edition is an indispensable resource. JOHN B. KNIGHT, EdD, is Director of Hospitality Management at Indiana University Purdue University, Fort Wayne. LENDAL H. KOTSCHEVAR, PhD, LD, is Professor Emeritus, Florida International University. QUANTITY FOOD PLANNING AND MANAGEMENT. Understanding Trends in Nutrition and Health. QUANTITY FOOD PRODUCTION AND MANAGEMENT. Cooking Principles, Methods, and Trends.